Today’s Island Profile is a guest post, provided by Nevin Thompson of Victoria, BC. Nevin Thompson frequently contributes blog posts about Vancouver Island, and works with Nakwakto Rapids Tours on northern Vancouver Island. If you have an idea for a guest post that you think might be relevant to my readers, please send me a direct e-mail. If you find yourself near Victoria and want to experience Vancouver Island’s wild West Coast but don’t have enough free time to make the trek to Tofino or Ucluelet, try heading out of Victoria towards hidden Mystic Beach in Juan de Fuca Provincial Park, just past Jordan River, next to China Beach. Mystic Beach is a special place. Unlike neighbouring China Beach (view the past Island Profile on China Beach here) or nearby French Beach, Mystic is not located close to any parking lot. Instead, visitors must trek through a winding rainforest trail that includes a cable suspension and giant log obstacles. 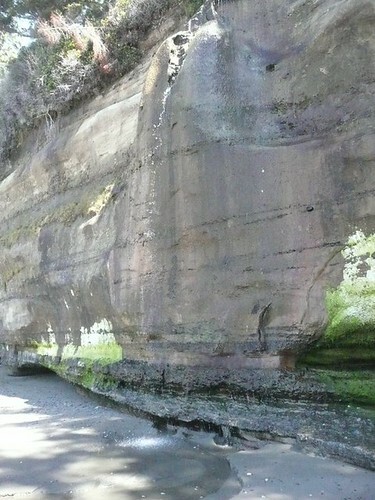 The final descent from the headland to the beach involves navigating several log ladders to the beach. But why go in the first place? The beach is fantastic! 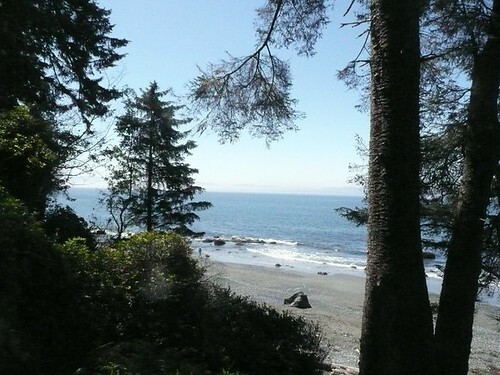 It’s secluded and offers stunning views of the Olympic Mountains across the Strait of Juan de Fuca. The coarse sand and pebbles of the beach provide plenty of privacy, but the real attraction of this special place are the sandstone cliffs that tower above the ocean, and at certain times of the year there are even small waterfalls trickling down onto the beach. The south end of the beach ends with a rocky jumble of borders stretching out into ocean, and just around the headland (inaccessible unless you’ve brought a boat) lies China Beach. 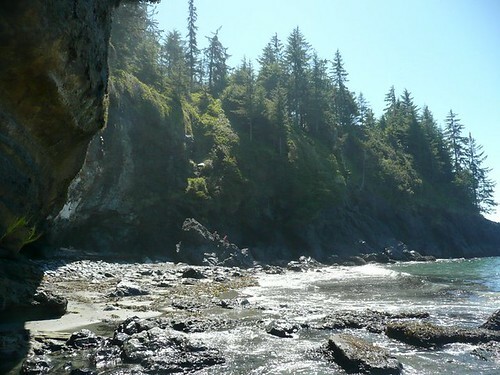 The north end of Mystic Beach is also bounded in by a steep and rocky headland, and also marks the start of the Juan de Fuca trail, a tough, multi-day hike stretching north to Sombrio (once famous for a resident family of surfers) and Botanical Beach. Provided they are able to walk 20 or 30 minutes from the parking lot along the forest trail to the ocean, Mystic Beach makes a perfect day trip with children. The tide pools at either end of the beach are great for learning about sea life, and if the weather is warm enough it’s also fun to splash around in the surf (bringing along life jackets may be a wise idea). 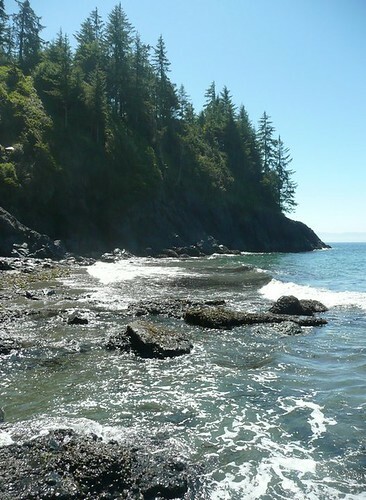 In the past, before the creation of Juan de Fuca Provincial Park, it was a tough tramp down to the beach from West Coast Road, over trails that were poorly maintained. It’s easier to get to these days, but not too easy; at the parking lot, most visitors choose to head down the easier trail to China Beach, leaving Mystic for die-hard nature lovers. To get to Mystic Beach, travel north towards Port Renfrew on West Coast Road from the West Shore region of Greater Victoria. 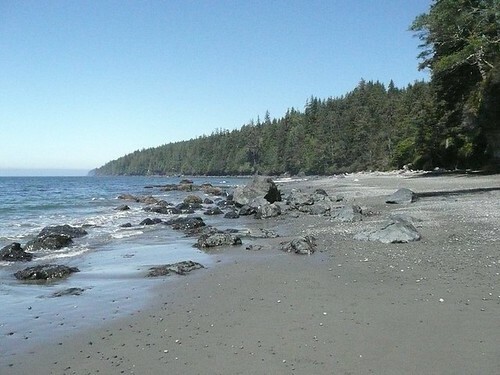 Stop in Sooke for supplies; Mystic Beach is located about 5 minutes past Jordan River. Please bear in mind that Mystic Beach is secluded so tell someone your plans for the day and come prepared with food and warm clothes. The West Coast’s weather can turn on a dime! I second that, the whole stopping in Sooke to get supplies. We thought Port Renfrew was bigger than it actually is. They have a general store but it is REALLY small and offers next to nothing for food.